Im not really sure if I understand it correctly, but did you meant something like this? Can you please describe more how it should be. 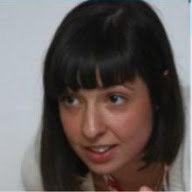 You can also clone the form to your acccount. Thank you. This is about 99% what I need. Because I am dealing with people who don't normally do this type of thing, is it possible to put it on the next line, indented slightly, with a tag that say "How Many"? Here is my form: http://form.jotformpro.com/form/52785777474979? Close, but not quite. I have attached a .pdf indicating where I need it. Your last post did not came trough. 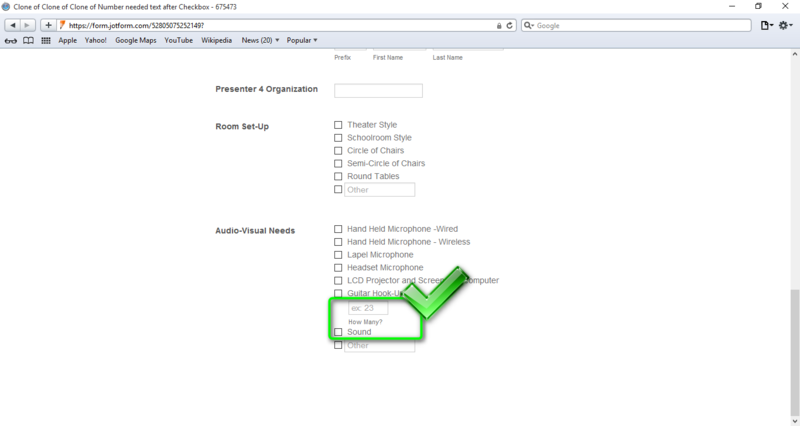 Can you please provide us a screenshot here on forum, how you want your field to be placed inside of your form. 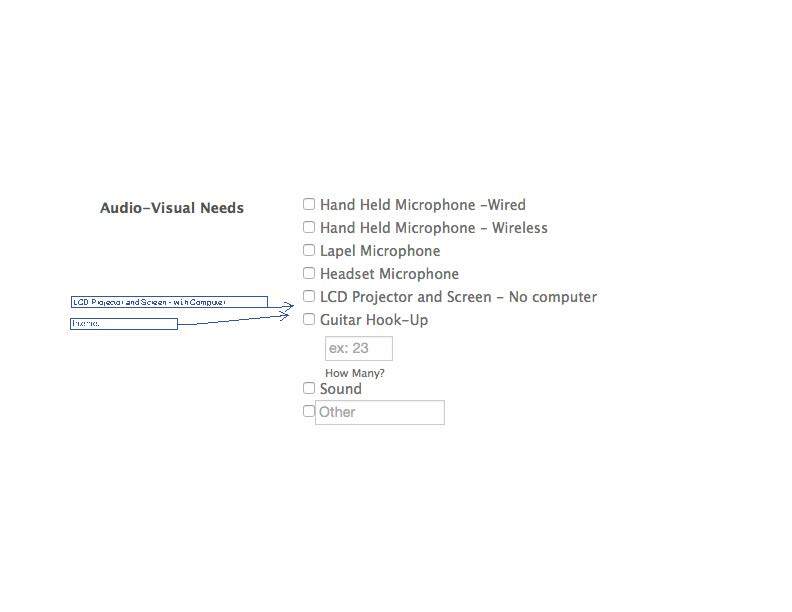 To achieve this I had to add two more checkbox options between options "Guitar Hook-Up" and "Sound" and then I used Custom CSS code to hide those options. Here is my form: http://form.jotformpro.com/form/52795740949977? This is great! Thanks. However, if I can be a bit picky, is there a way to add a little space between "how many" and "sound"? 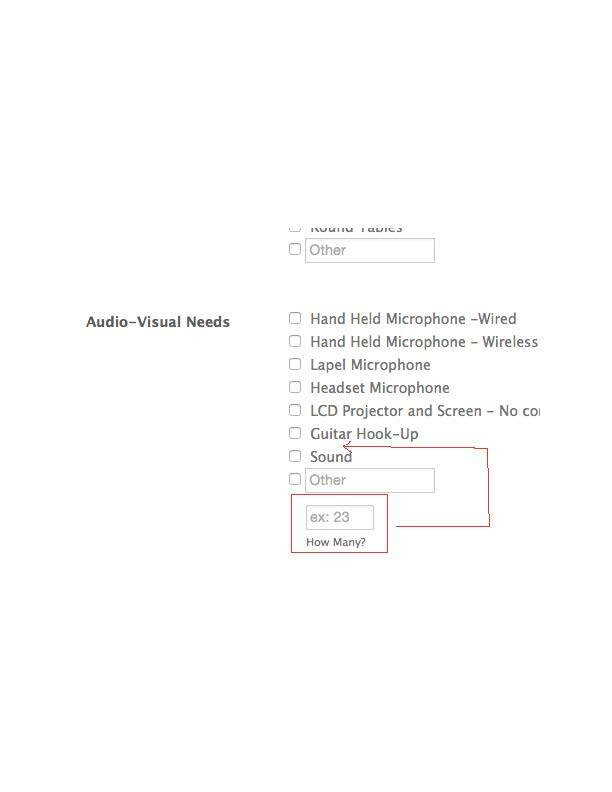 When I look at the form, "Sound" appears to be written over "how many"
What browser are you using on your end that is showing the overlapping? It might just need some slight tweaking of the css to adjust it a tidbit more possibly. Though, when I checked this on my end in Chrome, Edge, and IE it looks okay here. How much overlapping are you seeing on your end currently? I'm working in Safari. Its just a bit too close. Thank you kindly for the screenshot of the issue. I had an odd feeling the problem was in Safari. Anyhow, I was able to replicate the problem in the older Safari for Windows. So I've made a slight adjustment to the top-margin for that area above it in BJoanna's original example to try to fix it. Please check it on your end and let us know. Excellent! Thanks for all of your help. 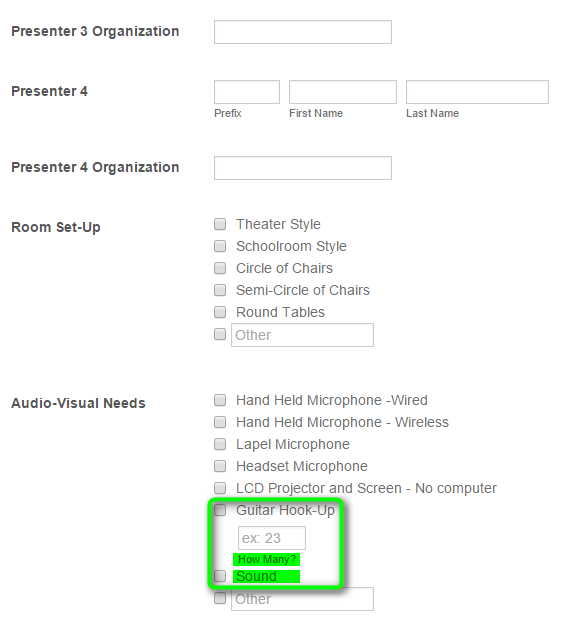 However, I have just been informed that I need 2 more check boxes before the one that says "Guitar Hook-Up". But when I try to add them it messes everything up! The first should say "LCD Projector and Screen - With a computer" and the second should say "Internet"
Thanks for all of your help. 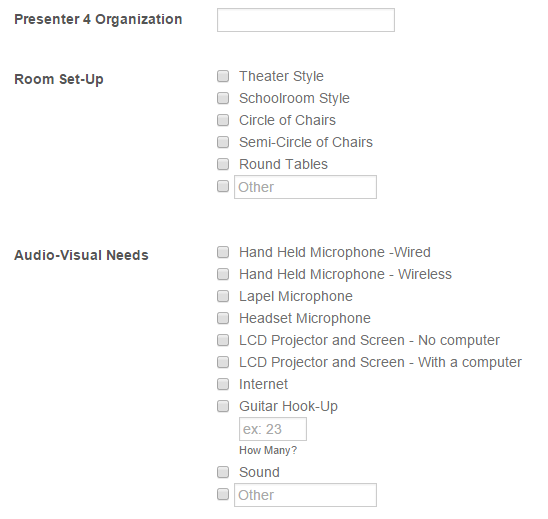 However, I have just been informed that I need 2 more check boxes before the one that says "Guitar Hook-Up". But when I try to add them it messes everything up! 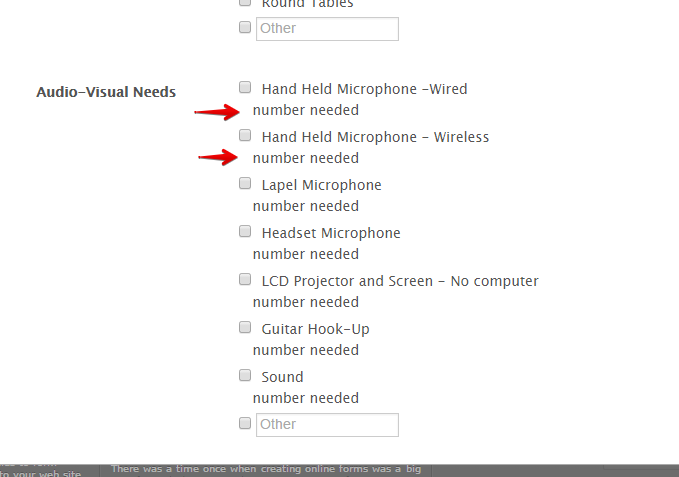 The first should say "LCD Projector and Screen - With a computer" and the second should say "Internet"
Can you please add first the 2 new options on the form http://www.jotform.us/form/52745051938157 this way we can properly create the need number needed input box on the finalized form. Let us know when you have done this and we will apply the modification on the form. The most up-to-date form is https://form.jotform.com/52805075252149? When I try to add the options in just really messes things up! The following is a screen shot of what I would like to see. Alrighty, I believe I get what you mean by that. The reason it got messed up is because elements in that field shifted around after adding the two new extra options. After a bit of elbow grease I've reworked the original css with a few tweaks to correct it. 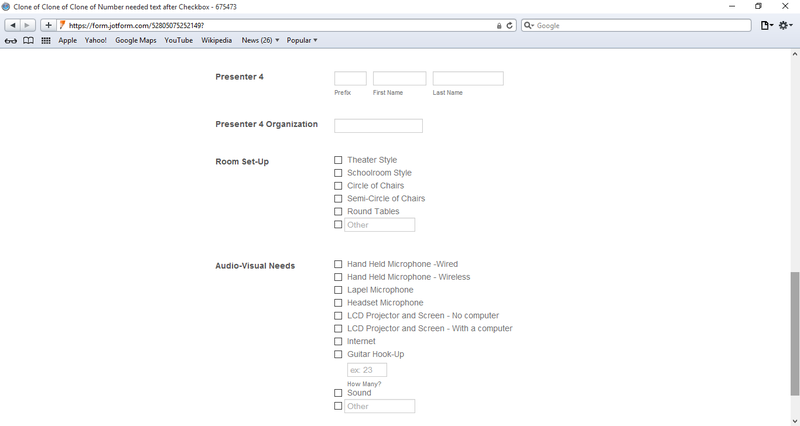 You'll either need to clone my updated demo form or replace the old injected css with the updated css below. Please check it on your end again and let us know. I also went ahead and checked it in Safari for Windows to try and save you time there again. On my end I can confirm it doesn't have the original overlapping issue even after updating the css to correct it with your new options. OK so one last (I hope) issue. 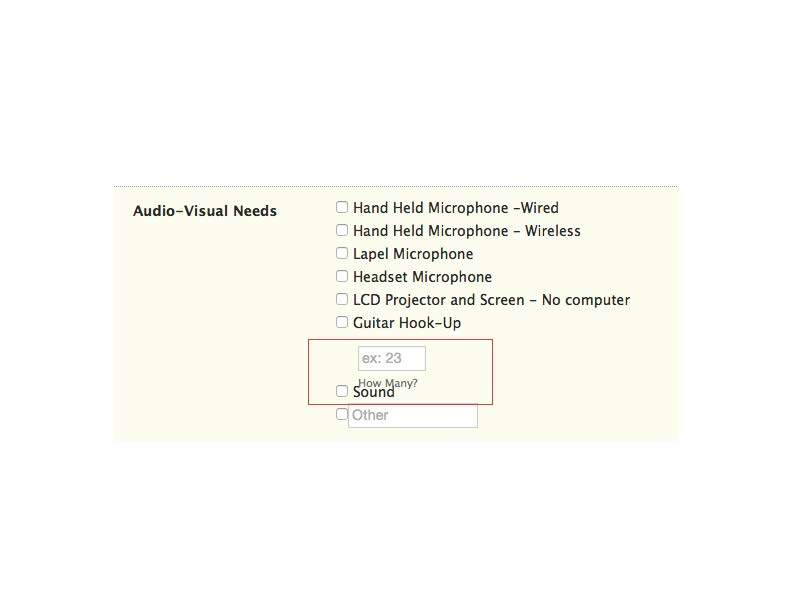 When I did a test form, I was unable to select "sound" as an option. It seems that the "How Many" box is blocking it some how. 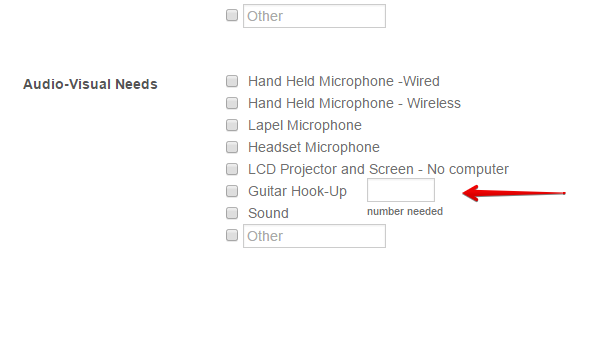 I was able to select "sound" option, but I had difficulties to select "Guitar Hook-Up" option. It probably depends of browser that is used. It will fix mentioned issue in all browsers. Here is my demo form: https://form.jotform.com/52811158971964?